The letter to the editor of the late Boston Herald that sparked Rachel Carson to write Silent Spring. Oddly, the Tweet from American Scientist doesn’t link to the letter at all. Instead it links to a timeline of events regarding the magazine’s changing treatment of DDT as a subject, since 1944. It’s a useful timeline, but it leaves us wondering about that 1958 letter to the editor. I’d like to have an original image, but have not found one. Instead, I found a retyped copy of the text of the letter, looking as though it came from a 1958 typewriter. Do you know where we might find an image of the original letter as published — preferably on the internet? It also occurs to me that this could be a key piece for a short lesson on the value of citizen involvement, for a class in civics and government, or in a class for Boy Scouts or Girl Scouts on one of the citizenship merit badges. 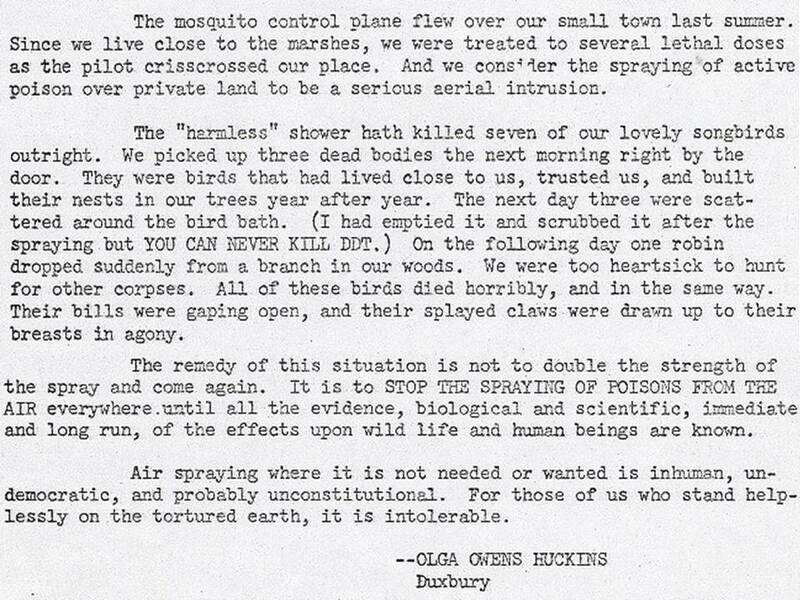 Mrs. Huckins’s letter is a fine example of the citizen acorns from which grow the oaks of political drives for better communities, and a better world. This entry was posted on Wednesday, February 3rd, 2016 at 3:12 am and is filed under Citizenship, DBQ sources, DDT, History, Newspapers, Rachel Carson, Science. You can follow any responses to this entry through the RSS 2.0 feed. You can leave a response, or trackback from your own site.